I am not afraid of color. You would not know that if you stepped into my house as most of the walls, tile, cabinets and furniture (so far) are white, beige, gray or greige (a combo of the two). I made two very bold color choices when designing this house. One (which you will see in a post in the near future) is a kelly green vanity in the girls' bathroom. The second is this accent wall in the playroom. Both of these decisions were met with much hesitation when I told my builder about the bright bold colors as he is all about the neutral tones. I have two kids, I am an artist/crafter/designer myself and wanted to do something that popped in my otherwise sterile and boring house (just wait until I repaint my dining room table legs hot pink!). I was later told by said builder that he loved my decision on color, so there! 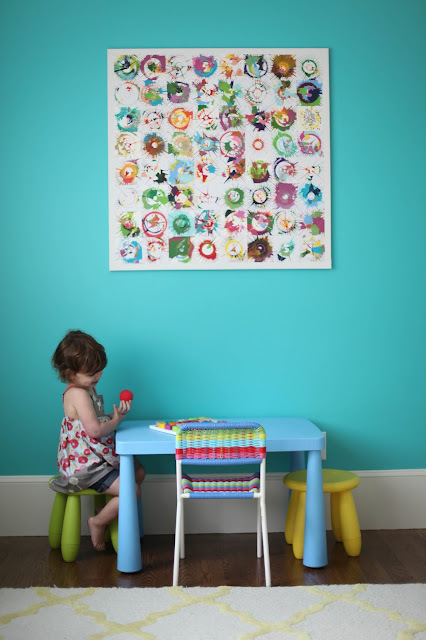 I had originally planned to paint more than one wall in the playroom this beautiful teal color (Miami Teal by Benjamin Moore), but decided to stick with this one side wall. The windows in the house are to the left of this wall, and get incredible light in the morning as our house is Northeast facing. I kept this wall simple as the color is already an attack on the senses, and put the spin art canvas M and I created last year as the main focal point. Below are table and chairs from Ikea, and for now we have that yellow crisscross rug from Overstock. I had plans to buy a new fancy rug for in there, but that won't be happening until the girls are older and aren't spilling things all the time, or drawing on rugs with markers! 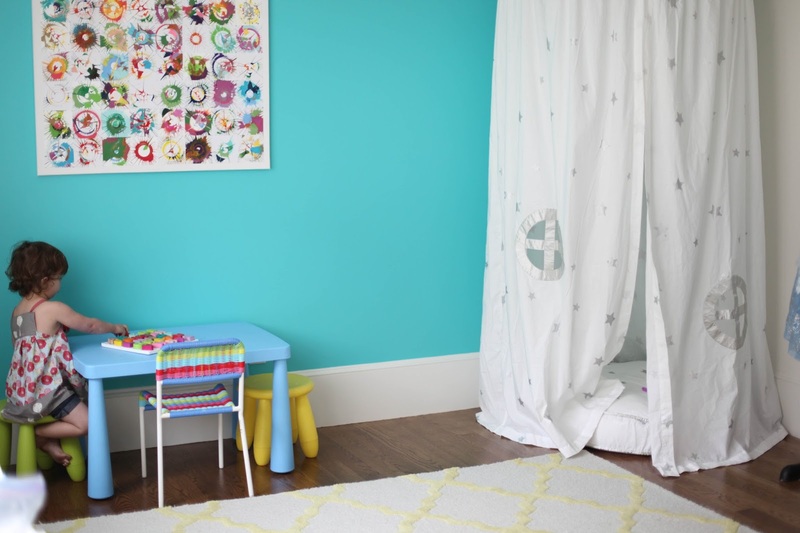 Hanging in the corner of the room is a tent from Land of Nod, that is affixed to the ceiling. More on that awesomeness in a later post! buying your baby girl nursery bedding is one very enjoyable activity to do. A pregnant mother looking for some nursery bedding for the crib of her baby girl is such a wonderful sight to see.